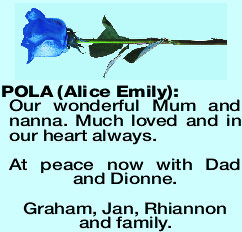 The Funeral Service for Mrs Alice Emily Pola of Kingsley and formerly of Ashby will take place in Bowra & O'Dea's Chapel, cnr Wanneroo and Victoria Roads, Westminster commencing at 9.30am SATURDAY (13.4.2019). A Private Burial will take place at a later time. 14.12.1916 - 7.4.2019 Dearly loved and loving wife of Bill (dec). Mother of Spencer and Graham. Grandmother of Tony, Tamara, Darelle, Nadine, Dionne (dec) and Rhiannon. Great grandmother to Danica, Emily, Jessica, Douglas, Tyler, Lola, Jethro and Eden. A Grand Centenarian Tribute to the worlds greatest Mum. A genteel lady of grace, poise and dignity. A life of giving, love and laughter. Always remembered with all our love. 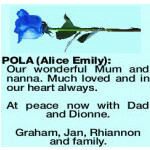 POLA ALICE EMILY Our wonderful Mum and nanna. Much loved and in our heart always. At peace now with Dad and Dionne . Graham, Jan, Rhiannon and family.